DON'T BE FOOLED BY THE INNOCENT LOOKING GRANOLA BAR! - Real Food. Real Fitness. 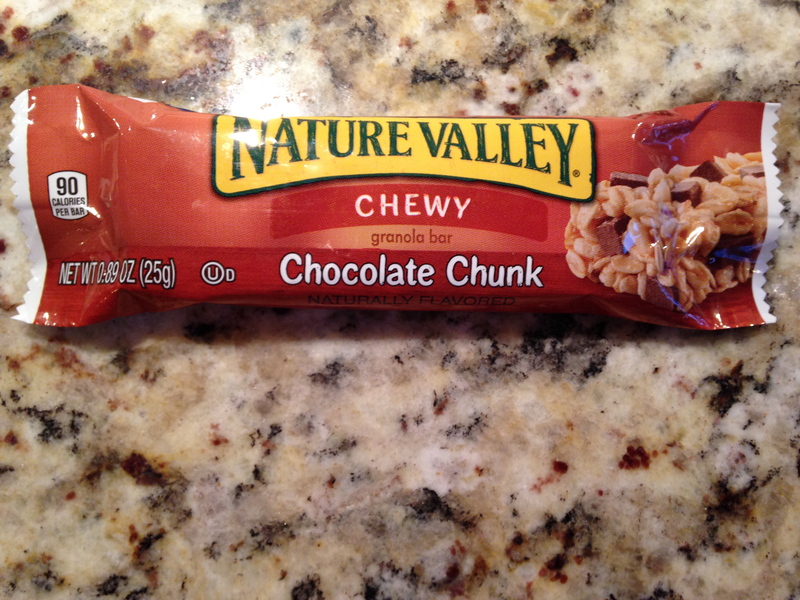 DON’T BE FOOLED BY THE INNOCENT LOOKING GRANOLA BAR! I am not surprised that most people today would skip chips for a granola bar thinking its the healthier alternative. In a sense I can see why. Chips are fried and loaded with refined salt where granola bars are made with oatmeal. Even for your kids if you were handed chips and a granola bar and told to serve the healthier snack it would be the granola bar, right? But this is where we all have to STOP and be label detectives. Sure it may contain less fat and calories but food is so much more than that. Don’t just assume a granola bar is a healthier alternative. Most all packaged granola bars are the same equivalent of junk food as chips are. Chips are processed and so are most of todays commonly known conventional granola bars. Below you will see really the farthest thing from nature. 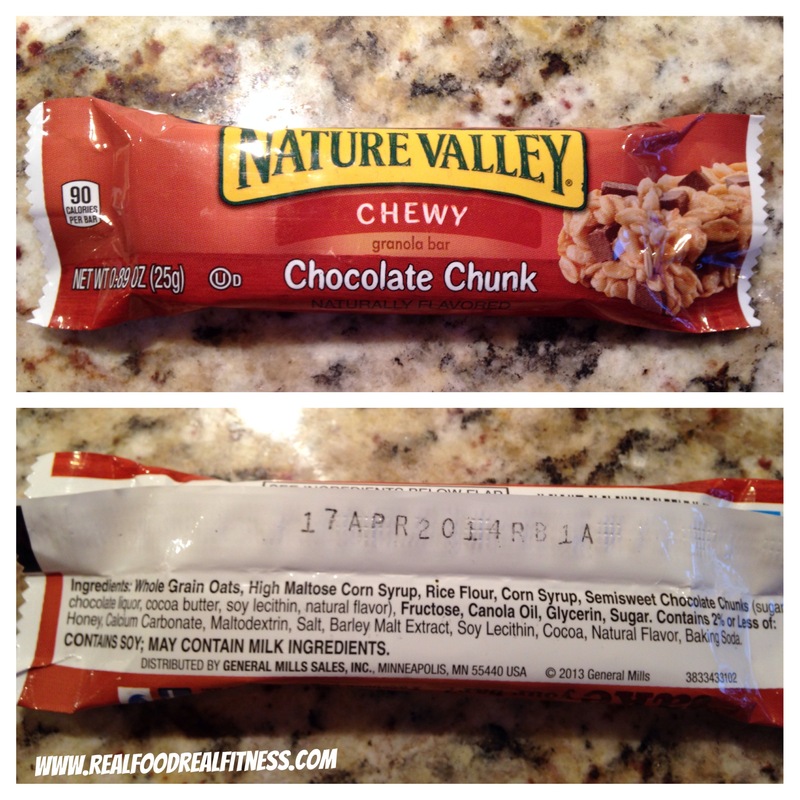 A Nature Valley chewy chocolate chunk granola bar. At first glance looks pretty harmless. Small with a nice photo of a oatmeal heavy minimal chocolate bar on the front. Turn it over and truth be told…..YIKES!! !….look at that ingredient list. (As someone who makes their own granola at home it takes 4 simple ingredients raw oats, coconut oil, maple syrup, cinnamon.) This bar contains over 18 ingredients many not easily understood. Whole grain oats – O.K. sure we know that would be the oats. Take note that Big Food company General Mills is who owns Nature Valley. General Mills has been under fire lately for using genetically modified oats in Cheerio’s. Hmmm…makes you wonder about the oats in this product. Also the oatmeal used in these bars has not been properly soaked/prepared so will contain the anti-nutrient phytic acid. Phytic acid binds to minerals and leeches them out of your body. Most people who have a grain heavy diet will also be mineral deficient because of this. Our bodies need minerals to survive and carry out daily functions. So you can see where not properly prepaired grains can be problematic to your health. High Maltose Corn Syrup – This is just another word for processed refined sugar. This specific type is only found in processed food and is derived from corn one of the most genetically modified crops today. Think of it as a cousin to the now “notoriously known bad for your health” sweetener high fructose corn syrup. Darn these food manufacturers get so tricky and clever trying to fool us! Just don’t consume this stuff. Its bad for your health and promotes weight gain and increases your risk of developing chronic diseases such as type 2 diabetes and heart problems. Corn Syrup Aha, we see it again, another clever cover up for processed refined sugar made from GMO corn. Semi Sweet Chocolate Chunks Self explanatory but yikes contains Soy Lecitin another GMO and soy a scary hormone disruptor. Fructose Oh my where do I start. Here is yet another sugar cover up. Fructose may be worse for your health than actual glucose sugar. Read more here! Canola Oil Another GMO product. The main problem with canola oil is that it has to be partially hydrogenated or refined before it is used commercially and therefore is a source of trans fatty acids. Trans fatty acids are one of the most toxic and harmful fats to consume. They are extremely dangerous and increase your risk for heart attack and stroke. Glycerin A preservative used as a sweetener or thickener in processed foods. Interesting that glycerin contains a warning that for people with heart, liver or kidney problems, it’s best to avoid this ingredient. Glycerin is also the main ingredient in most soaps. Hmmmmm, sounds appetizing! I think its best for us all to avoid this preservative. Sugar Well what do you know here is sugar the last ingredient. Actual real sugar is the last sweetener they choose to use! That is because it’s cheaper for U.S. companies to use high fructose corn syrup than cane sugar! But what about the above 4 other ingredients that are also forms of sugar??? So far its proving to be the main ingredient in this bar. Lastly in the ingredients is the “contains 2% or less of” area. – Are we supposed to just ignore this part and say “whatever it’s only 2%”. I think not! Whether its 2% or 50% putting toxic gmo preservatives and ingredients into a so called food bar is not o.k. just look at this list honey,calcium carbonate,maltodextrin,salt,barley malt extract, soy lecithin, cocoa, natural flavor, and baking soda. Amazing just an innocent looking bar is hiding so much garbage inside. Most packaged food is junk food. Whether its granola bar, chips, or goldfish you can pretty much lump them all together and call them processed junk. You may be trying to watch your weight or improve your health and pick a granola bar over chips. The food industry wants you to believe that there are “healthier” cereals, crackers and snack bars and they do a good job at promoting these. Don’t fall for it! It all adds up to be the same dump of empty calories and nutrient deficient food products in your body. Yup its baby steps and I get that but sometimes those baby steps are not leading to anything bigger because you are just swapping one junky food product for another. Instead of looking for “healthier” chips or bars skip it all together and pick REAL WHOLE food. Fruit, veggies, fermented veggies and dairy, healthy fats, pastured meats, full fat raw dairy, raw sprouted nuts/seed and create your own snacks from these. The sooner you can train your taste buds to enjoy the taste of REAL whole food over junk the better and cravings will go away! 3 cups gluten free oats, 3/4 cup organic unsweetened coconut flakes, 3/4 cup sliced raw almonds, 1/2 tsp cinnamon, 1/2 cup REAL maple syrup, 1/3 cup coconut oil, 1 tsp vanilla. Mix oats, coconut, cinnamon, and almonds in a medium sized bowl. Mix maple syrup, coconut oil, and vanilla in a separate bowl. Combine the syrup mixture with the oat mixture and stir until evenly coated. Pour the mixture onto a greased baking sheet and spread to cover evenly. Bake for 30 Minutes, stir and bake another 20-30 minutes depending on preferred doneness. Can be stored in an airtight container.